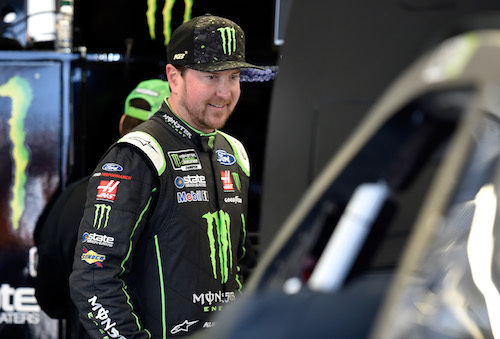 Stewart-Haas Racing expects to retain the services of Kurt Busch, along with his veteran teammates Aric Almirola, Clint Bowyer and Kevin Harvick, through the 2019 Monster Energy NASCAR season according to Sports Business Journal/Sports Business Daily’s Adam Stern. “@StewartHaasRcng tells @SBJSBD that it expects to have all four of its current drivers in the Monster Energy NASCAR Cup Series back with the team in 2019,” Stern (@A_S12) tweeted on July 3. Busch signed a one-year extension with SHR in late 2017 that kept him in the fold through the 2018 Cup Series season, so another extension for 2019 is expected. As teams typically keep mum on contract details, the length of time remaining on Almriola, Bowyer and Harvick’s contracts with the race team are not publicly know. Almirola is in his first year with Stewart-Haas since moving from Richard Petty Motorsports to replace the retired Danica Patrick. Bowyer, meanwhile, replaced the retiring Tony Stewart a year earlier and is in his second year with SHR. Harvick and Busch are Stewart-Haas Racing’s longest-tenured drivers, joining the team ahead of the 2014 season when it expanded to a four-car operation. Both Busch and Harvick are former Cup Series champions. Harvick’s championship came with Stewart-Haas Racing in his first-year with the team. It was the second Cup Series title for SHR, the first being won with Stewart behind the wheel in 2011. In 2018 Harvick and Bowyer have combined for seven wins in the first 17 races of the season, with Harvick tying Kyle Busch for most wins on the season, so far, with five. SHR’s stable of Cup Series drivers is veteran-heavy, with drivers ranging in ages from 34 (Almirola) to 42 (Harvick). Stewart-Haas also has an up-and-comer in the wings — Cole Custer. Custer is in his second season of full-time competition in the NASCAR Xfinity Series, but he has made two Cup Series starts this year with Rick Ware Racing, through a partnership with Stewart Haas.